We’d love your help. 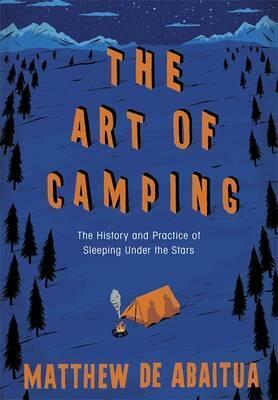 Let us know what’s wrong with this preview of The Art of Camping by Matthew De Abaitua. To ask other readers questions about The Art of Camping, please sign up. Most of my family holidays as a child involved camping, and my love of camping has continued through my five decades on the planet. I am well aware not everyone shares my enthusiasm, indeed until relatively recently camping was something of a minority activity. Somewhere in the early 2000s, probably after a financial crash, camping in the UK enjoyed a surge in popularity, getting coverage in newspaper weekend lifestyle magazines and with the publication of books like “Cool Camping”. I’m pleased t Most of my family holidays as a child involved camping, and my love of camping has continued through my five decades on the planet. I am well aware not everyone shares my enthusiasm, indeed until relatively recently camping was something of a minority activity. Somewhere in the early 2000s, probably after a financial crash, camping in the UK enjoyed a surge in popularity, getting coverage in newspaper weekend lifestyle magazines and with the publication of books like “Cool Camping”. I’m pleased to report that The Art of Camping: The History and Practice of Sleeping Under the Stars by Matthew De Abaitua is written by someone who is steeped in camping having also camped as a kid and who never stopped. This book is a winning combination of memoir and history, and I was frequently struck by how many experiences we had shared, for example lugging kit for an entire family from a festival car park to the campsite some considerable distance away, or contemplating driving off a site in the wee small hours. Matthew De Abaitua has done a wonderfully thorough job of creating an accessible and insightful history of camping, peppered with some great personal anecdotes, and also solid practical advice. As with many great books that are ostensibly about one thing (camping in this instance), in many ways it is also about everything. Peppered amongst this camping memoir are many a philosophical nugget which touch upon that age old question of what it is to be human. Even if you don’t like camping I think this book would be worth a read, and if you are already a convert then you should find loads to enjoy here - not least the youth movements spawned in the 1920s and 1930s like the Kindred of the Kibbo Kift, the Woodcraft Folk, and The Order of Woodcraft Chivalry. An interesting, witty, helpful, well written, passionate book, and an unexpected gem. Well worth reading. The history parts of this book are great. Those parts often do not blend well with the more autobiographical/travelogue parts. It managed to tastefully discuss the impact of Nazi Germany on camping influences. Some things fell into the realm of quirky Britishness but the book was still very much accessible and relevant to an American audience. This is an astonishingly good book about an unlikely topic. I'm really glad I stumbled on this one.